Hello Everyone! 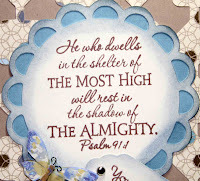 I'm cutting it really close today getting this card finished for Our Daily Bread Designs Shining Light Challenge. EEK! There is a chance to win a gift card that can be used toward some of their great stamps. However, the inlinkz is going to close in 2 hours so, I had to work fast because I forgot all about it. The first thing I did was cut out the geometrical lacy background you see here using my Cricut Expression and Paper Lace cartridge. If you don't own that one, it's a must have for card crafters! The designer paper is from SU and it's called Elegant Soiree. Next, using Elegant Edges I cut out this open scalloped circle and the base for it. I used SU Very Vanilla CS for the open scallop and Baja Breeze for the base. I stamped the open scallop with one of Mike's favorite scriptures. It's from ODBD's Scripture Series 2. I sponged the edges with Weathered Wood Tim Holtz Distress Ink. I cut out this crescent shaped tag using a Sizzlets die and I stamped it with a sentiment from the Verve "Here for You" stamp set. The pretty butterfly is from K & Co. Watercolor Bouquet Collection. Great card, love the butterfly! Wonderful card! I love the cut background. I just bought this cartridge. I really love the focus on the sentiment. WOW! That die gives a whole different look to the DP. So pretty Jennipher. gorgeous and I love the look of your blog. The background is fabulous and I've never seen anything like it before! That must be a fun cart for the Cricut! 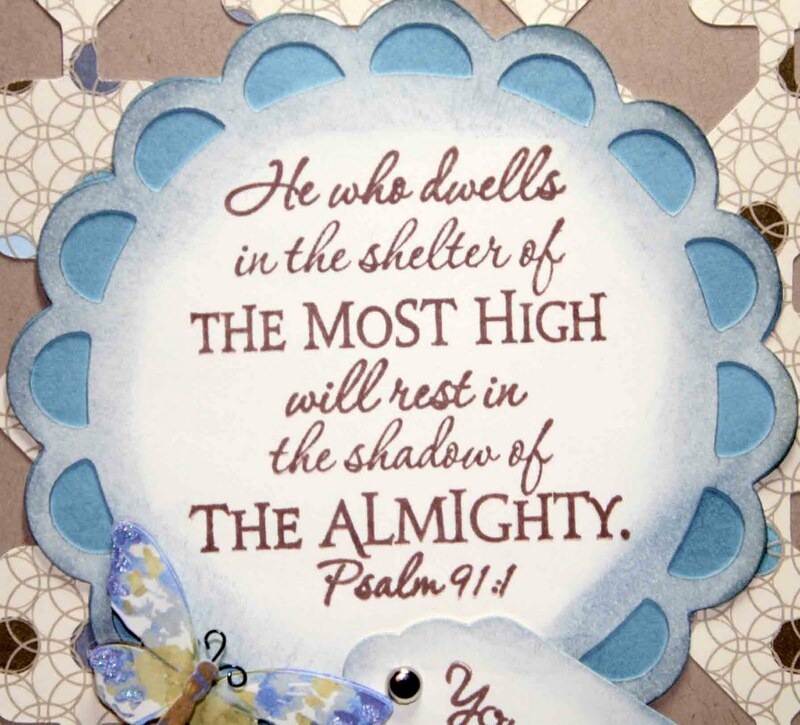 I love the colors and beautiful sentiment too, all making for one lovely card! 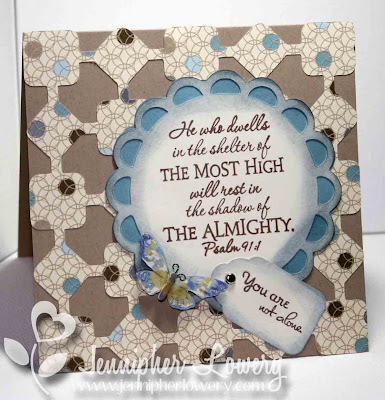 jennipher this is a beautiful card..
ODB stamps are always wonderful..and this card is wonderful as well..TFS! This is just awesome Jennipher! That background is sooo cool & the colors you used are very soothing! Beautiful work Hun & TFS!!! Gorgeous card!! I love the geometric pattern.. so pretty!! This is beautiful, Jennipher! That's a very striking cut you used for the background. Looks great with that designer paper. What a fabulous card you created, I must get to using that cartridge more often... Lovely! Wow girl, you work GREAT under pressure!!! Love it! So, so beautiful! Your card does shine the light! You WON!!!! Congratulations. You deserve it. 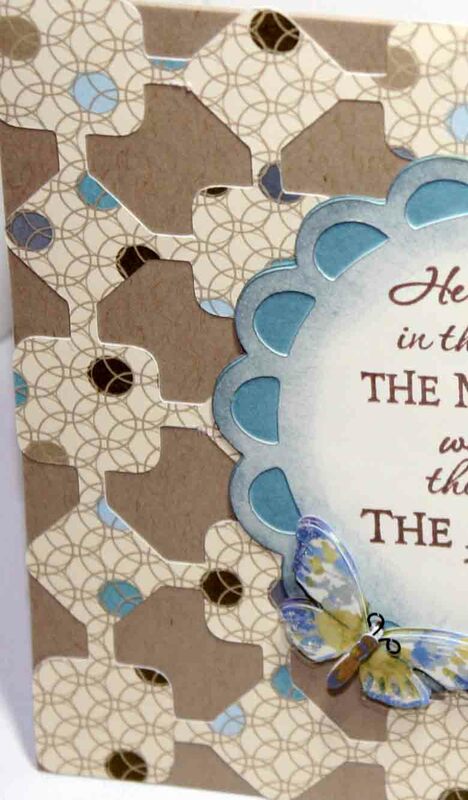 Beautiful die cuts and butterfly. Congrats on your Shining the Light Award, Jennipher! Your card is so pretty *and* interesting, with the intricate cutting!